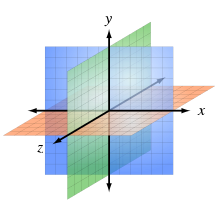 A right-handed three-dimensional Cartesian coordinate system used to indicate positions in space. Galilean and Cartesian theories about space, matter and motion are at the foundation of the Scientific Revolution, which is understood to have culminated with the publication of Newton's Principia in 1687. 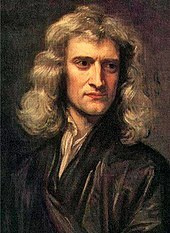 Newton's theories about space and time helped him explain the movement of objects. 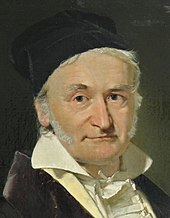 While his theory of space is considered the most influential in Physics, it emerged from his predecessors' ideas about the same. As one of the pioneers of modern science, Galilei revised the established Aristotelian and Ptolemaic ideas about a geocentric cosmos. He backed the Copernican theory that the universe was heliocentric, with a stationary sun at the center and the planets—including the Earth—revolving around the sun. If the Earth moved, the Aristotelian belief that its natural tendency was to remain at rest was in question. Galilei wanted to prove instead that the sun moved around its axis, that motion was as natural to an object as the state of rest. In other words, for Galilei, celestial bodies, including the Earth, were naturally inclined to move in circles. This view displaced another Aristotelian idea—that all objects gravitated towards their designated natural place-of-belonging. Descartes set out to replace the Aristotelian worldview with a theory about space and motion as determined by natural laws. In other words, he sought a metaphysical foundation or a mechanical explanation for his theories about matter and motion. Cartesian space was Euclidean in structure—infinite, uniform and flat. It was defined as that which contained matter; conversely, matter by definition had a spatial extension so that there was no such thing as empty space. The Cartesian notion of space is closely linked to his theories about the nature of the body, mind and matter. He is famously known for his "cogito ergo sum" (I think therefore I am), or the idea that we can only be certain of the fact that we can doubt, and therefore think and therefore exist. His theories belong to the rationalist tradition, which attributes knowledge about the world to our ability to think rather than to our experiences, as the empiricists believe. 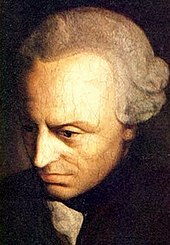 He posited a clear distinction between the body and mind, which is referred to as the Cartesian dualism. Following Galilei and Descartes, during the seventeenth century the philosophy of space and time revolved around the ideas of Gottfried Leibniz, a German philosopher–mathematician, and Isaac Newton, who set out two opposing theories of what space is. Rather than being an entity that independently exists over and above other matter, Leibniz held that space is no more than the collection of spatial relations between objects in the world: "space is that which results from places taken together". Unoccupied regions are those that could have objects in them, and thus spatial relations with other places. For Leibniz, then, space was an idealised abstraction from the relations between individual entities or their possible locations and therefore could not be continuous but must be discrete. Space could be thought of in a similar way to the relations between family members. Although people in the family are related to one another, the relations do not exist independently of the people. 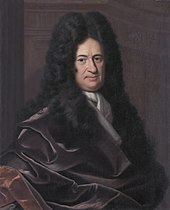 Leibniz argued that space could not exist independently of objects in the world because that implies a difference between two universes exactly alike except for the location of the material world in each universe. But since there would be no observational way of telling these universes apart then, according to the identity of indiscernibles, there would be no real difference between them. According to the principle of sufficient reason, any theory of space that implied that there could be these two possible universes must therefore be wrong. 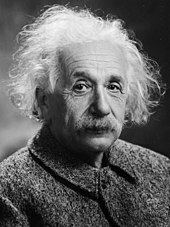 Furthermore, in Einstein's general theory of relativity, it is postulated that space-time is geometrically distorted – curved – near to gravitationally significant masses. Space has been studied in the social sciences from the perspectives of Marxism, feminism, postmodernism, postcolonialism, urban theory and critical geography. These theories account for the effect of the history of colonialism, transatlantic slavery and globalization on our understanding and experience of space and place. The topic has garnered attention since the 1980s, after the publication of Henri Lefebvre's The Production of Space . In this book, Lefebvre applies Marxist ideas about the production of commodities and accumulation of capital to discuss space as a social product. His focus is on the multiple and overlapping social processes that produce space. In his book The Condition of Postmodernity, David Harvey describes what he terms the "time-space compression." This is the effect of technological advances and capitalism on our perception of time, space and distance. Changes in the modes of production and consumption of capital affect and are affected by developments in transportation and technology. These advances create relationships across time and space, new markets and groups of wealthy elites in urban centers, all of which annihilate distances and affect our perception of linearity and distance. In his book Thirdspace, Edward Soja describes space and spatiality as an integral and neglected aspect of what he calls the "trialectics of being," the three modes that determine how we inhabit, experience and understand the world. He argues that critical theories in the Humanities and Social Sciences study the historical and social dimensions of our lived experience, neglecting the spatial dimension. He builds on Henri Lefebvre's work to address the dualistic way in which humans understand space—as either material/physical or as represented/imagined. Lefebvre's "lived space" and Soja's "thridspace" are terms that account for the complex ways in which humans understand and navigate place, which "firstspace" and "Secondspace" (Soja's terms for material and imagined spaces respectively) do not fully encompass. Postcolonial theorist Homi Bhabha's concept of Third Space is different from Soja's Thirdspace, even though both terms offer a way to think outside the terms of a binary logic. Bhabha's Third Space is the space in which hybrid cultural forms and identities exist. In his theories, the term hybrid describes new cultural forms that emerge through the interaction between colonizer and colonized. ^ "Space – Physics and Metaphysics". Encyclopædia Britannica. Archived from the original on 6 May 2008. Retrieved 28 April 2008. ^ Refer to Plato's Timaeus in the Loeb Classical Library, Harvard University, and to his reflections on khora. See also Aristotle's Physics, Book IV, Chapter 5, on the definition of topos. 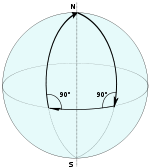 Concerning Ibn al-Haytham's 11th century conception of "geometrical place" as "spatial extension", which is akin to Descartes' and Leibniz's 17th century notions of extensio and analysis situs, and his own mathematical refutation of Aristotle's definition of topos in natural philosophy, refer to: Nader El-Bizri, "In Defence of the Sovereignty of Philosophy: al-Baghdadi's Critique of Ibn al-Haytham's Geometrisation of Place", Arabic Sciences and Philosophy (Cambridge University Press), Vol. 17 (2007), pp. 57–80. ^ French, A.J. ; Ebison, M.G. (1986). Introduction to Classical Mechanics. Dordrecht: Springer, p. 1. ^ Carnap, R. (1995). An Introduction to the Philosophy of Science. New York: Dove. (Original edition: Philosophical Foundations of Physics. New York: Basic books, 1966). ^ Janiak, Andrew (2015). "Space and Motion in Nature and Scripture: Galileo, Descartes, Newton". Studies in History and Philosophy of Science. 51: 89–99. doi:10.1016/j.shpsa.2015.02.004. PMID 26227236. ^ 1958–, Dainton, Barry (2001). Time and space. Montreal: McGill-Queen's University Press. ISBN 978-0-7735-2302-9. OCLC 47691120. ^ Dainton, Barry (2014). Time and Space. McGill-Queen's University Press. p. 164. ^ Tom., Sorell (2000). Descartes : a very short introduction. Oxford: Oxford University Press. ISBN 978-0-19-154036-3. OCLC 428970574. ^ Leibniz, Fifth letter to Samuel Clarke. By H.G. Alexander (1956). The Leibniz-Clarke Correspondence. Manchester: Manchester University Press, pp. 55–96. ^ Vailati, E. (1997). Leibniz & Clarke: A Study of Their Correspondence. New York: Oxford University Press, p. 115. ^ Sklar, L. (1992). Philosophy of Physics. Boulder: Westview Press, p. 20. ^ Sklar, L. Philosophy of Physics. p. 21. ^ Sklar, L. Philosophy of Physics. p. 22. ^ "Newton's bucket". st-and.ac.uk. Archived from the original on 17 March 2008. Retrieved 20 July 2008. ^ Carnap, R. An Introduction to the Philosophy of Science. pp. 177–178. ^ Lucas, John Randolph (1984). Space, Time and Causality. p. 149. ISBN 978-0-19-875057-4. ^ Carnap, R. An Introduction to the Philosophy of Science. p. 126. ^ Carnap, R. An Introduction to the Philosophy of Science. pp. 134–136. ^ Jammer, Max (1954). Concepts of Space. The History of Theories of Space in Physics. Cambridge: Harvard University Press, p. 165. ^ A medium with a variable index of refraction could also be used to bend the path of light and again deceive the scientists if they attempt to use light to map out their geometry. ^ Carnap, R. An Introduction to the Philosophy of Science. p. 148. ^ Sklar, L. Philosophy of Physics. p. 57. ^ Sklar, L. Philosophy of Physics. p. 43. ^ Castelvecchi, Davide; Witze, Alexandra (11 February 2016). "Einstein's gravitational waves found at last". Nature News. Archived from the original on 16 February 2016. Retrieved 12 January 2018. ^ "Cosmic Detectives". The European Space Agency (ESA). 2 April 2013. Archived from the original on 5 April 2013. Retrieved 26 April 2013. ^ Stanek, Lukasz (2011). Henri Lefebvre on Space : Architecture, Urban Research, and the Production of Theory. Univ of Minnesota Press. pp. ix. ^ "Time-Space Compression – Geography – Oxford Bibliographies – obo". Archived from the original on 20 September 2018. Retrieved 28 August 2018. ^ Harvey, David (2001). Spaces of Capital : Towards a Critical Geography. Edinburgh University Press. pp. 244–246. ^ W., Soja, Edward (1996). Thirdspace : journeys to Los Angeles and other real-and-imagined places. Cambridge, Mass. : Blackwell. ISBN 978-1-55786-674-5. OCLC 33863376. ^ 1901–1991., Lefebvre, Henri (1991). The production of space. Oxford, OX, UK: Blackwell. ISBN 978-0-631-14048-1. OCLC 22624721. ^ 1946–, Ashcroft, Bill (2013). Postcolonial studies : the key concepts. Griffiths, Gareth, 1943–, Tiffin, Helen., Ashcroft, Bill, 1946– (Third ed.). London. ISBN 978-0-415-66190-4. OCLC 824119565.